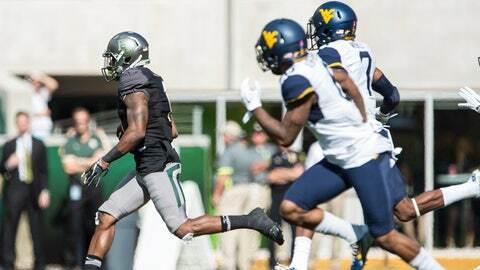 Baylor wide receiver Corey Coleman set a Baylor single-season record and leads the nation with 16 touchdown catches. Perhaps the most riveting competition between the No. 2 Baylor Bears and No. 3 TCU Horned Frogs isn’t in the standings, but in the statistics being put up by each team’s star wide receiver. Both Baylor junior Corey Coleman and TCU senior Josh Doctson are leaving their respective school records in the dust while each sits among the top three in the nation in receiving yards, receiving yards per game and touchdowns. They both are among the top three in three major categories and sit 1-2 in receiving yards per game and touchdowns, with Doctson leading the nation at 152.4 yards, and Coleman second at 146.2; Coleman leads the nation with 16 touchdowns and Doctson has 12. Doctson recently became TCU’s all-time receptions leader, and Coleman last week already set a new Baylor record for touchdown receptions in a single season. So which player is better, the 6-foot-3, 195-pound Doctson, or the 5-11, 190-pound Coleman? West Virginia coach Dana Holgorsen, fresh off seeing Coleman up close in a three-touchdown, 10-catch, 199-yard performance against his Mountaineers, called Coleman the best player in college football. Later Saturday evening, Doctson, as if determined to keep up, torched Iowa State for 10 catches, 190 yards and two touchdowns. Last week, TCU coach Gary Patterson said Doctson was playing as well as anybody in the country, including the two Heisman frontrunners, Horned Frogs quarterback Trevone Boykin and LSU tailback Leonard Fournette. Baylor and TCU won’t meet until Nov. 27. It will be TCU’s final regular-season game while Baylor will have one left against Texas the following the week.